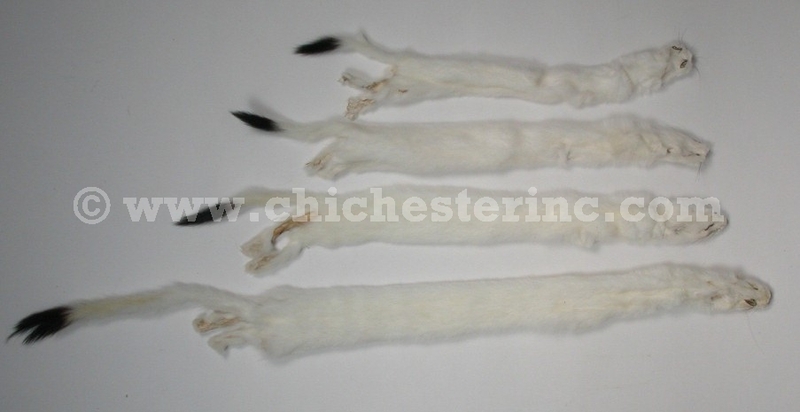 We sort our ermine skins into different sizes and grades based on quality. We measure from the tip of the nose to the end of the tail (i.e., the entire length of the skin and tail). They do not have the feet and claws attached. Each ermine skin weighs ~1 oz (28.4 gm). The select ermine skins we offer are select soft-cased skins that have a nice natural white color without extensive yellowing, holes, or short tails. The #1 ermine skins are full skins of good quality that are natural white with some creaminess. They are not clear white. The #2 ermine skins are full skins with small problems such as hair slips, small tears and more yellow discoloration. The craft grade skins have more serious problems such as more gray hair, more extensive yellowing and more hair slips. Click HERE to see a picture of the yellowed ermine. The gray backs are ermine that have started to change into their summer coat and have a grayish or brownish coloring on the back. They are approximately 14" to 18" long. Click HERE to see a picture of the dyed craft grade ermine. Ermine are not an endangered species.